finish your day with the perfect party! We offer a friendly, relaxed and professional service which is completely bespoke for you – it’s your day and we enjoy working with you to ensure it ends with the perfect party. Our wedding DJ service includes setting up and use of all sound, DJ equipment, disco lights and uplights, which all look and sound great. We take great pride in our presentation and ensure everything looks as neat and tidy as possible, including ourselves – after setting up we always dress smartly! As professional DJs, we only use industry standard equipment (Technics record decks, Pioneer CD decks and mixer, a first class sound system (for most venues our lovely warm HK active 600W or 1000W PAs are more than adequate but we have rigs big enough for festivals if required! ), American DJ LED uplights and disco lights, with everything neatly mounted on a single stand) which is regularly PAT tested and we have public liability insurance cover up to £5m. Whatever you want at your reception, we will work with you to make sure everything is perfect, so you can relax and enjoy the evening. We just wanted to say a massive thank you for playing at our wedding yesterday. Everyone had a fantastic time and the music you played was awesome! Thanks for making our special day even more special. 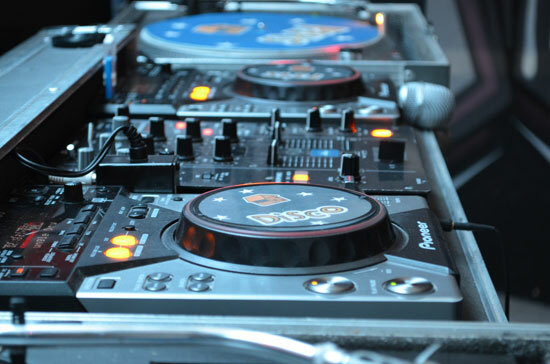 Hear our DJs in action!